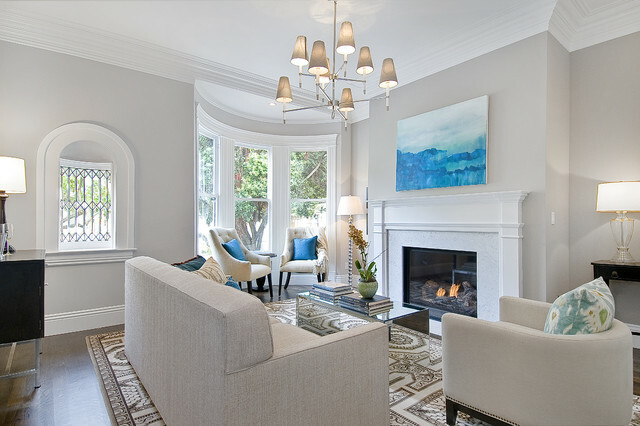 Living Room - Traditional - Living Room - San Francisco - by Cardea Building Co.
Design & Construction: Cardea Building Co.
where can I find the rug? Who makes this rug and where can it be purchased? Same I love the rug where do I buy it? Can you tell me the color you used for the trim? Thank you so much. It's a beautiful combination of colors. What color are the walls please? Can someone tell me where I can source this beautiful, modern yet elegant light? thanks! How many inches away is it from the ceiling to the upper shade top? I am not sure though I know it comes with several rods that are about 12" long, so the height can be adjusted incrementally though not with the same range as if it were hung by a chain. Did you find out the name of this sofa... or something similar? Chandalier - Who is it by? Where was the chandelier purchased? Very pretty! Nice designing for this room! Where can I find those chairs by the bay window? Would you know the brand/style of the rug. It is gorgeous. Can you please tell me the exact paint color for this room. Lovely. Abalone BM, is what the designer said. stairsw he used Balboa mist by BM also. Can you tell me where you purchased the glass lamp near the fireplace? I'm looking for the same thing. Art work - Love the colors. Custom painted? Where can I get one too? Can you please tell me whether the ceiling and trim are same color? Picture custom done? I love the pop of color. Paint looks like Pale Oak benjamin moore by Candice Olsen collection? Beautiful fireplace surround! Is that marble? What kind is it? Thank you! The immediate surround is white carrera, the detailed outer surround is wood painted white. Ceiling - What is the paint on the ceiling? Valspar's Moonbeam is a similar color. Sofa source? - Great lines in the sofa. Can you provide source please? Was there a designer that worked on the space or was that all you Cardea? Is the coffee table available anywhere? It is gorgeous! Perhaps the color focal point in your space comes more from accessories than furnishings. If you have artwork that makes a bold color statement, introduce that same color into your living space with décor elements such as throw pillows or rugs.